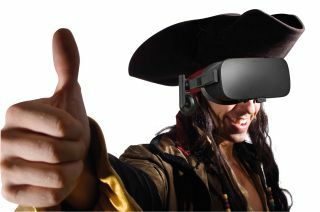 A software update for the Oculus Rift, designed to clamp down on piracy, has backfired. It's actually made it easier. The Revive hack let people play Oculus-exclusive games on the HTC Vive by circumventing restrictions, before Oculus responded with a DRM update that prevented it from working. But Revive has found a workaround that not only bypasses the new DRM restrictions, but now makes it easier to pirate games. "The original version of Revive simply took functions from the Oculus Runtime and translated them to OpenVR (an API compatible with Vive and other headsets)," Motherboard explains in an interview with Revive's creator Libre VR, "the new version of Revive now uses the same injection technique to bypass Oculus' ownership check altogether." This means the game can no longer determine whether you are, in fact, the legitimate owner. Interestingly, Libre VR said on Reddit that he didn't set out to enable piracy, and does not endorse the use of Revive to do so. He added that if he finds a workaround that doesn't circumvent the author check, he'll implement it. He also said that he would like to work with Oculus VR on a way of getting games onto other headsets without bypassing the authorship check, although we're not sure Oculus will be up for it - despite Palmer Luckey's prior comments about not caring if people mod games to play them on other headsets. We've contacted Oculus for comment and will update this story if we hear back.